Lemgo can be reached by "eurobahn" train from Bielefeld Hauptbahnhof (Bielefeld main station) which is well connected to the German ICE network and accessible easily from all over Germany. From here take the bus no. 732 heading to "Bad Pyrmont Markt", exit at "Waisenhausplatz" and walk two minutes. Take the highway "A2" and exit at "Herford/Bad Salzuflen". Follow the "B 239" to Bad Salzuflen and Lage and then the "B 238/B 66" to Lemgo. Follow the signposts to the city center. There are parking grounds all around. Tip: Take the parking garages "Regenstorplatz" or "Bleiche". At the Lemgo railway station take the bus no. 732 heading to "Bad Pyrmont Markt" and exit at "Waisenhausplatz". From here walk two minutes to the city center. Lemgo is a nice medieval city in the north-west of Germany, in the "Ostwestfalen-Lippe" region. Its historical buildings and churches belong to the most beautiful ones all over Germany. Lemgo was founded in 1190 by the masters of Lippe at an intersection point of two very important merchant routes. During the mid age the city of Lemgo was a member of the Hanseatic League, and it is even today called "Alte Hansestadt" ("Old Hanseatic City"). Especially the historic city center is worth a visit! There are plenty of historic buildings with timber frames to be viewed. Especially the relicts of the old city wall, such als the "powder tower" (Pulverturm) in the "Neue Straße", the "High Tower" (Hoher Turm) in the street "Im Rembken" or the old bastion at the "Kastanienwall" which was reconstructed in 1990 for the 800th anniversary of the city. Furthermore the city hall (Rathaus), the so-called "Hexenbürgermeisterhaus" (which is most likely Lemgo's most famous building) and the churches "St. Marien" and "St. Johann". The "Hexenbürgermeisterhaus" is a museum nowadays with exhibitions of relicts from the Lemgo history. But also the outdoor view is recommended - the facade is the most beautiful one in Lemgo. Lemgo is the location of the "Hochschule Ostwestfalen-Lippe" (Ostwestfalen-Lippe University), focused particularly at engineering sciences and engineering technology, such as architecture, computer engineering, bio technology, electrical engineering, future energies and way more. For local recreation, there are two parks, a smaller one in the south-east and a large one in the north of the city. South-east of the historic city center there is the "Abteigarten Lemgo" which was built in the 18th century by the Earl of Lippe. His sister was the abbot of the St. Marien Abbey - this is the origin of the name. The garden was in ownership of the abbey till the 20th century - then the city bought it and made it public. The second park in the north is called Staff-Landschaftspark which is in the ownership of the noncommercial "Staff foundation". The configuration of the park in a low-key manner with some interesting pieces of modern art started in the early 1990s. Conclusion: a visit in the city of Lemgo is really recommended. The Lemgo city hall is a building of historic importance which was built over several eras. In the beginning there was a gothic market hall which was changed into the first city hall later. The building phases are lying in the Gothic and Renaissance age, especially in the regional "Weserrenaissance"; especially seen in the magnificent facades of the access balcony and the jutties. The "Lippische Strohsemmel" (translated: "straw roll from the Lippe region") is a speciality of Lemgo. Legend has it that the recipe was brought to Lemgo in 1812 by a soldier (who was a baker as well) from Russia. He was baking rolls for his companions and scalded the yeast dough (as it was common in Russia). As he didn't have a baking tray he used straw instead; and a master baker from Lemgo bought the recipe's right of use. So they are available even nowadays. TBV Lemgo (abbreviation for "Turn- und Ballspielverein Lemgo") is a team handball club playing in the highest german handball division (Bundesliga). Usually they are playing their home matches in the Lipperlandhalle in Lemgo (5,000 visitors), but for bigger events (such as Europe Cup Matches) they use sometimes the "Gerry-Weber-Stadion" in Halle/Westfalen (11,000 visitors). If you want to watch an exciting handball match live, go ahead and make sure that you get a ticket! This 3-star hotel is quietly located near Lemgo’s historic town centre, 1 km from the Lipperlandhalle Hall. 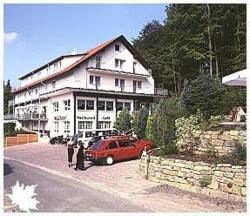 The Lemgoer Hof offers free Wi-Fi internet, free minibar drinks and free parking. Located in Lemgo, this 3-star hotel offers an indoor pool, free Wi-Fi, and its own restaurant with beer garden. It is conveniently set just 5 km from Lemgo’s historic Old Town district. The 2-star Waldhotel Dörentrup is located close to the Teutoburg Forest and offers a total of 50 beds in bright, cheerful guest rooms with modern furnishings. Each room is fitted with a balcony providing a wonderful view.